Well, I did it. 31 days without a single quilty thing bought! AND 3 tops completely from stash finished with borders on a 4th. Not a bad showing since I work full time outside the home. My goals for the month of Sept. are to continue my ban on new book/magazine/pattern purchases. Limit myself to fabric for one new project - that has to be finished in September or I can't buy fabric in Octoboer. And no other purchases unless they are for something I specifically need like batting, thread, needles, etc. Oh and to find a LA quilter to send 3 tops out to. The hour-a-day I just finished, my Christmas Pineapple Blossom from January, and my Maple Leaf pictured here. Another great fall quilt that deserves to be on my bed not a forgotten top in the cupboard. But this one is probably around queen size so I'm not even going to attempt quilting it myself. This is from a swap I hosted on another YahooGroups list I used to be on called Quilt Friends. I love the way the top turned out and I've always had plans to hand-quilt this with some kind of swirly design to represent wind. But this top has already sat around for almost 6 years so it's time to just send it out and get it finished. My only exception to my Sept. no-buy will be this upcoming holiday weekend. I'm headed to MS to visit with Susan as she deals with trying to get Daddy's long term care settled. There's nothing at all I can do but it's something I think I need to do for her AND for me. It's just where I need to be this weekend. I don't think there's a fabric shop anywhere in town anymore so I'm pretty safe there but if we do find one I'm giving myself permission to shop. Retail therapy, you know. VBS. Can't leave you for 4 days without another cat picture to carry you thru. LOL! This is Fluffy and Agatha. Hard to believe they're litter mates, huh? Congratulations on meeting your August goals. Hope you have safe travel and that you get to enjoy some retail therapy too. Nancy - that is a wonderful fall quilt! I want to make a Maple Leaf quilt someday... Definately worth sending out for quilting and you know - there are so many wonderful pantos out there! Well done with finishing your quilt tops in the month of August and sticking to the no fabric purchase pledge. I like your focused plan for September. I wish I lived closer to you--I could help you with that quilting--but alas, I am too far away! Keep going, girl! And keep inspiring us to follow your lead! Congratulations on your gold star. Hope you get things sorted out on the weekend for your Dad. No holiday here, working all weekend. So it will be Labor Day for me! Nancy, congrats on the 4 quilt tops. I am sooo impressed. I work FT and to find an hour a night to sew is a miracle. Kudos to you!! Hope everything is sorted out for your Dad. You just being there helps everyone.. YOur september goals are lofty!! I am still thinking about mine and will post this weekend..
Best to you and your family.. you are in my prayers..
Have a safe trip and enjoy the time sewing with your sister. Here's to finding a fun shop you didn't know about. Be safe! Enjoy your time with Susan and give your dad some hugs! 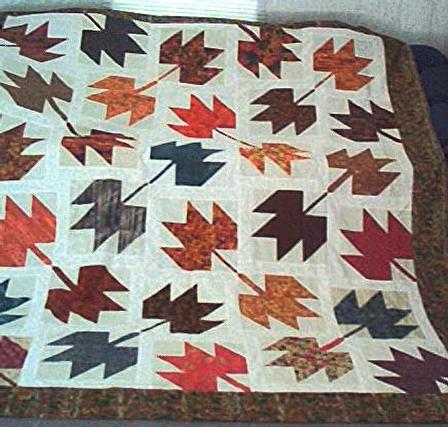 Your maple leaf quilt is wonderful and the idea to quilt it with wavy lines representing the wind is a good idea. I'm sure the LAQ can do that. Can't believe those two cats are from the same litter. Amazing. You are most assuredly a star for the continued "NO BUY". That Maple Leaf quilt is beautiful! That'll be a nice one to have finished and on your bed. Agatha and Fluffy are so sweet. Must be different dads? Cats can do that, can't they? I like how the blocks are offset on the maple leaf but couldn't quite tell how you'd set it. I'll be heading home on Monday to help my Mom again - she's having her 2nd cataract surgery. Sometimes you just need to be there and even though Susan is dealing with your Dad I'm sure she'll really appreciate your support. Nancy, LOve the maple leaf. Have a safe trip, enjoy the time with your sister. Hope and pray all goes well with your father. Beautiful! Really wish fall were nearer - 101 out today! See you when you get back then. You and Susan probably have a lot to get settled and the visit will be good for both of you. Good for you getting those tops completed and sticking to your goals this month. 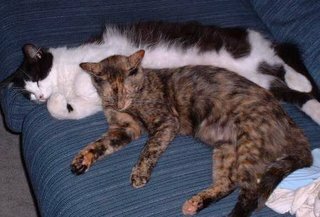 I cannot believe that those two are litter mates--mom and dad must have been two totally different types of kitties to have the babies come out like that!! Have a great time with your sister, and good luck with all you have to do with your Dad. Have a good, safe trip Nancy, and a great time with your sister. Love the leaf quilt! I have plans to make one too, eventually, and mainly because those are my favorite colors. Have a safe trip Nancy. That maple leaf quilt is lovely. Hi Nancy, I've just gotta leave you hugs and a pile of gold stars for how well you DID in August. I was a little worried about you those first few days, but you did it, and did it with style! Love the leaves. Have been saving tree and leaf quilt pictures because one or the other or both will be in the quilt I make for our youngest son. As for dealing with your dad, praying for you and Susan. Been there, done that not easy, but the sense of relief is such a blessing. Have a safe trip, Nancy! Fluffy and Agatha certainly do not look like littermates; each such a distinctive kitty type. I love your leaf quilt. Have fun with Susan even though the trip is part business. You have inspired me Nancy!! If you can finish 4 quilt tops in one month while working full-time, I'm going to have to give it a go too! Loved your post. Wow - you sure had a successful August didn't you? Congratulations on all that achieved. Your Maple Leaf quilt is very inspiring - don't forget to put all the participants names on the label. I always forget to keep the lists of swaps that I take part in.